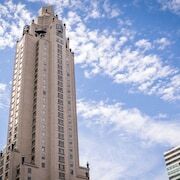 With a stay at The Lowell, you'll be centrally located in New York, minutes from Barney's and Bloomingdale's. 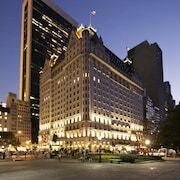 This 5-star hotel is close to Rockefeller Center and Broadway. Make yourself at home in one of the 74 individually decorated guestrooms, featuring refrigerators and flat-screen televisions. Your bed comes with down comforters and Frette Italian sheets. Wired and wireless Internet access is complimentary, while iPod docking stations and cable programming provide entertainment. Private bathrooms have deep soaking bathtubs and designer toiletries. Satisfy your appetite at the hotel's restaurant, which serves breakfast, dinner, and brunch, or stay in and take advantage of 24-hour room service. Featured amenities include complimentary wired Internet access, a 24-hour business center, and limo/town car service.